May 3, 2016|Posted in: Happy, Healthy, Smart Kids!, Holidays and Seasons, Let's Eat! Here’s a super fun treat the kids will LOVE!! Rice Krispie Treats shaped like Ice Cream Cones! They make a fun treat for Birthday Parties, Valentine’s Day, April Fools Day, and Every Day! In a large mixing bowl combine half of the marshmallows and half of the butter. Add 4-5 drops of red food color. Stir until all marshmallows are melted and mixture is well blended. Add half of the rice cereal and stir until it is completely covered. In a separate large mixing bowl, repeat steps 1-5 adding 1 tbsp of cocoa (instead of red food coloring) on step 4. 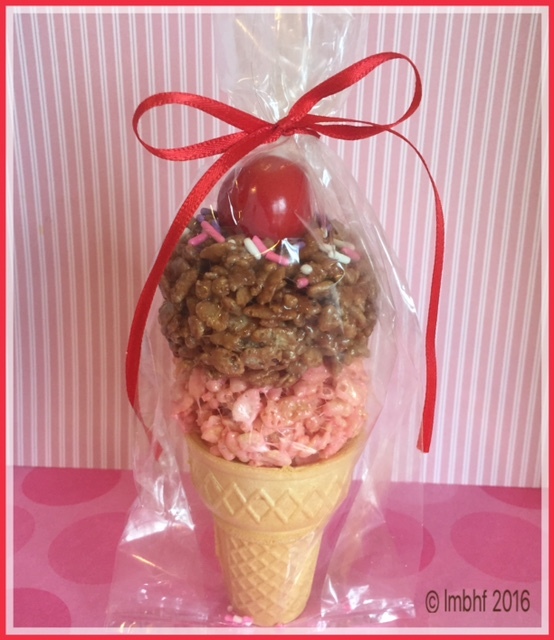 Fill the base of your ice cream cones with your choice of either the pink or cocoa rice krispie treat mixture and pack it down. 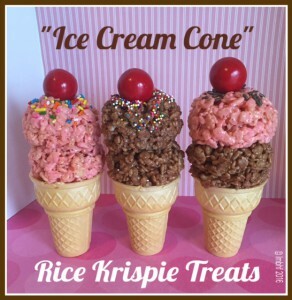 Using an ice cream scoop put two scoops of rice krispie treat mixture on top of each cone. Decorate with sprinkles and a cherry (large red gumball) on top! These make fun gifts or party favors when wrapped individually and tied with a ribbon! What a cute idea for Valentine’s day! They look tasty too. But what cute gifts they could make as well. Thank you for sharing with #blogginggrandmothers. I shared on my social media. Thanks Clearissa, I appreciate that! Now what a fun treat. Really thought they were ice cream cones at first. Thanks for linking up with Blogging Grandmothers. The grandbabies would love this for sure. So cute and I know they must taste good! Thank you for partying with us at Blogging Grandmothers Link Party. I shared your post on my social media sites. These are adorable. 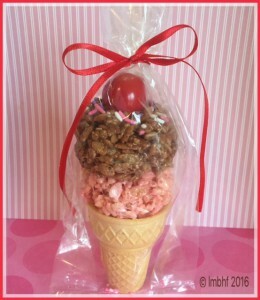 They would be great for a kid’s birthday party or summer time treat. Thanks for sharing. I’m pinning. Thank you very much Rhonda! Thank you so much Beverly! Shared! These look amazing! Thanks so much for linking up at #familyfriday we appreciate it! We hope you come back next week. Yes, you can! Theu’re very easy to make! You should do it Roberta. They’ll love it! This would be a great birthday party treat. I would say that it’d be good to send to school for kids, but so many schools have restrictions now I’d hate to have someone make them and then have to throw them out. They would be fun at a birthday party! Thank you so much Patty!